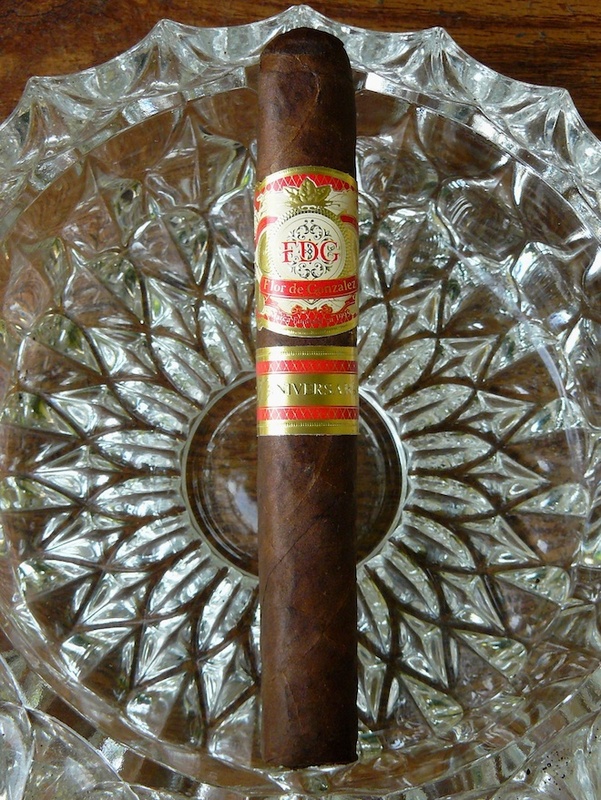 In 2015, Flor de Gonzalez, maker of the popular 90 Miles cigars, released the 20 Aniversario line to commemorate the 20th anniversary of the opening of the family’s factory in Hialeah, FL in 1995. Although manufacturing has since moved to Nicaragua, Flor de Gonzalez continues to maintain a presence in Florida. The 20 Aniversario comes in both an 8 year-old Ecuadorian Connecticut and a 5 year-old US Connecticut Broadleaf Maduro wrapper. According to the information that brand owner Yadi Gonzalez Vargas sent me, those two wrappers were chosen because they were the wrappers used on the original Flor de Gonzalez cigars. Sizes for both wrapper lines are: Robusto 5 ½ x 50, Toro 6 ½ x 54, and Torpedo 6 ½ x 52, with all of them having a soft box press. Prices run from $9.60 for the Connecticut Robusto to $10.80 for the Broadleaf Torpedo, with 1,500 boxes of each wrapper and vitola being released. 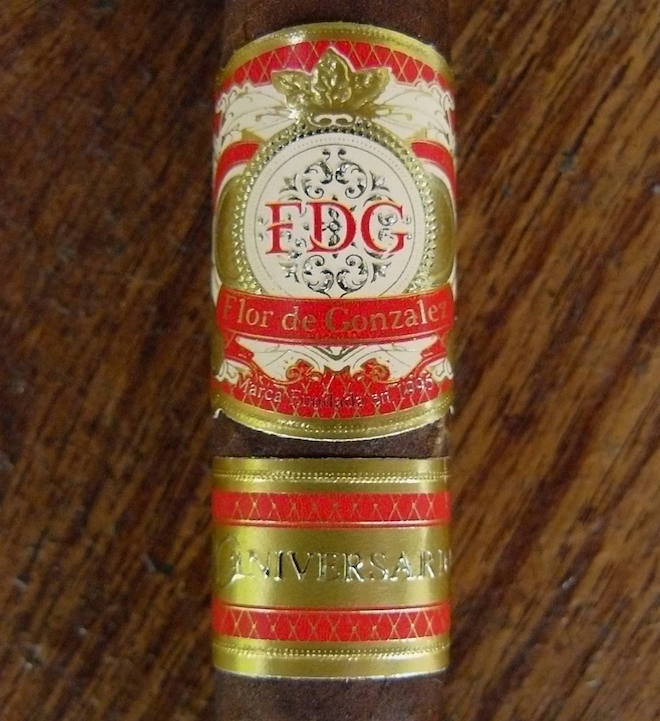 The FDG 20 Aniversario Maduro presents itself in a rustic wrapper mottled in medium to very dark hues of brown with a few small to medium veins in a lumpy, bumpy, and firm roll. The bands are quite handsome in their gold, red, and beige color scheme. The wrapper gives off a light, tart barnyard scent, while the foot adds mossy earth to the aroma. 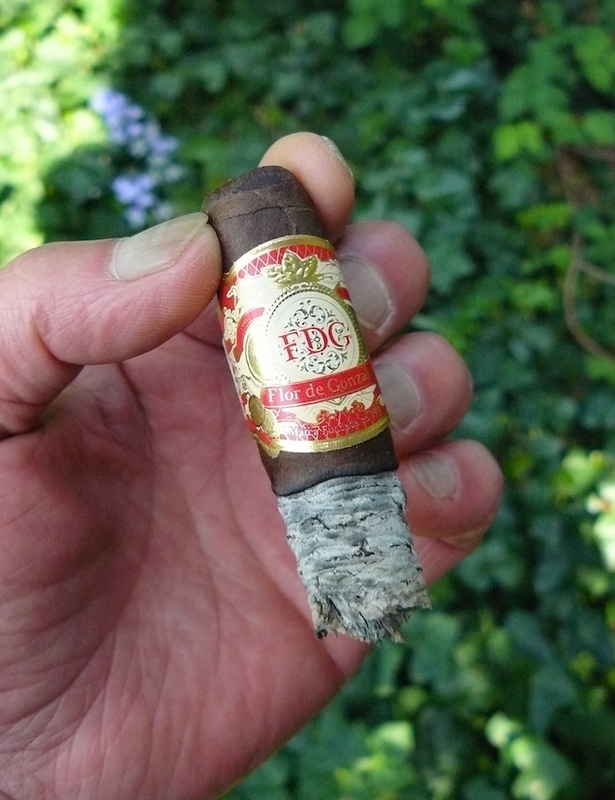 Once clipped, the draw is rather tight, but offers up sweet spice and natural tobacco notes. The snug draw doesn’t keep the Flor de Gonzalez 20 Aniversario from giving up a generous mouthful of smoke. The sweet spice is first to hit the tongue, followed by earthy tobacco, oaky wood, and black pepper pungency. The pepper soon recedes, as leather, light coffee, and a bit of savoriness creep in. The burn line is a little thick and just a bit slanted, leaving behind a compact, light and medium gray layered ash that hangs on well past an inch before falling into my ashtray. The Flor de Gonzalez 20 Aniversario Maduro moves into its middle third adding bready notes while presenting a smooth and rather refined front, while now burning sharp and evenly. 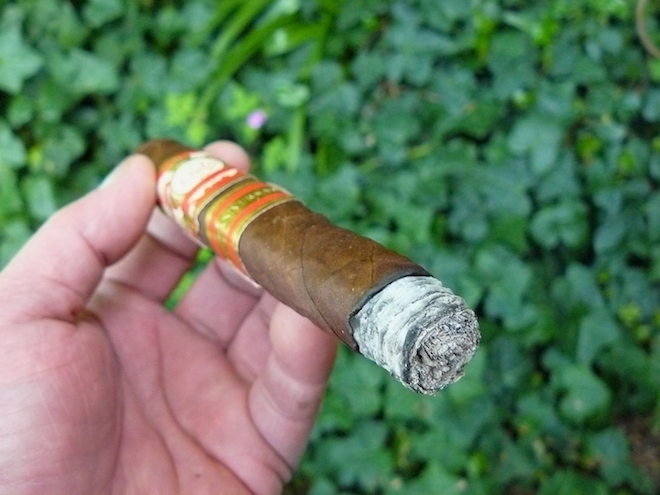 A zing that’s not quite metallic, but more mineral, has shown up as the cigar moves into medium-plus territory. Near the tail end of this section, the coffee has morphed into more of a bittersweet mocha and a tiny amount of wood char has also moved in. The earth, wood, and sweet spice continue to drive the cigar, while coffee and light char linger in the background along with occasional hints of cream. The pepperiness that had faded in the prior third has returned with a little more than an inch remaining. The Flor de Gonzalez 20 Aniversario Maduro smokes absolutely cool and firm down to the nub, ending at medium-plus in body and low-medium in strength. The Flor de Gonzalez 20 Aniversario Maduro is a great example of how our expectations can sometimes fool us. While I was figuring that I was in for a big, sweet, chocolaty smoke, it turned out to much more refined than that, and that’s cool. Not every Broadleaf stick has to hit one over the head with big, rich chocolate flavors, and I very much enjoyed this experience, although the first one I smoked actually did have more sweet mocha in it while I smoked it. 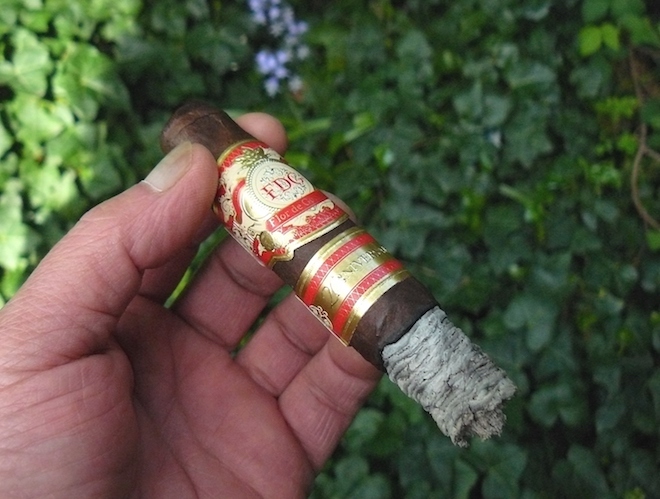 The flavors were smooth and melded very well, and the construction, despite the initially tight draw, was superb, with not a thought of having to reach for my lighter for corrections or re-lights and there was no problem getting a copious amount of smoke from the cigar. For a limited edition cigar, I think the price is very reasonable, and I would certainly recommend giving it a try. You can pick up the Flor de Gonzalez from our good friends at Cuenca Cigars here. 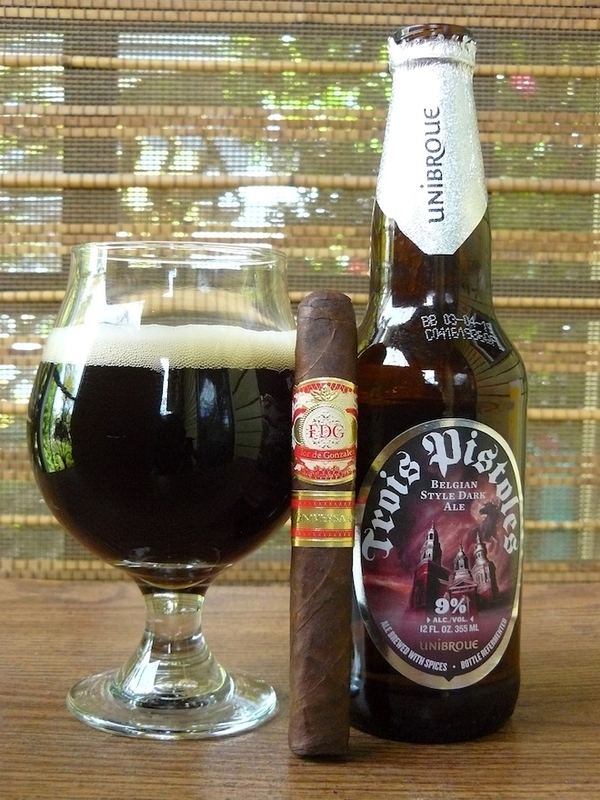 The Unibroue Trois Pistoles Belgian style ale from Casas Fumando’s favorite Canadian brewery is described as a “strong dark ale”, but it always seems pretty damned smooth to me, with the 9% alcohol being well hidden. I don’t get the celery and tomato flavors that Tony does, but more dark fruit and heady malt, which is why I wanted to pair it with this cigar. It did indeed make for a harmonious match initially, but somehow a very tangy finish, which I haven’t experienced before, crept in later and threw things off a bit. It’s probably just an anomalous batch, so I would definitely give it another shot. Otherwise, a nice sweet strong or Wee Heavy ale, a coffee porter, a sweet rum, or fruity bourbon would also be something I would pair with the Flor de Gonzalez 20 Aniversario Maduro.